Now, when news breaks in Japan, send your report to the world in real-time. The NHK International World Broadcasting Studio. It may be compact, but this hybrid TV studio supports a variety of film formats. Live feeds to foreign broadcasting offices are no problem, and it can even do online streaming. 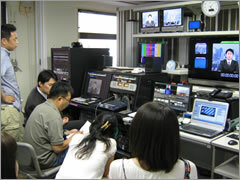 The NHK International World Broadcasting Studio contains all the traditional video recording features you'd expect for putting together a live foreign broadcast, but it has also been outfitted with the latest digital production tools. 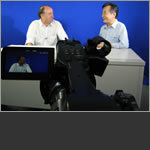 Easily create a variety of digital content, from live feeds to productions. The virtual studio has all the capability you'll need for your production: live feeds, internet broadcasting, event recordings. With this compact system, you can go from initial setup to final edits with a crew of just a few people. *The downloading of images from this site is strictly forbidden. Copyright 2006 NHK International, Inc. All rights reserved. Unauthorized copy of these pages is prohibited.